On Your Mark, Get Set, Cook! Are Meal Kits a Better Deal than Grocery Shopping or Eating Out? When done right—when you’re in a good mood and it’s the right time of day—there can be something truly blissful about wandering the aisles of your local supermarket, getting lost between the bulk items, the frozen foods, and the endless shelves of beers you’ve never heard of, or never tried, but want to get to know on a personal level. The rest of the time, real life gets in the way. Likewise, eating out at a restaurant can be a fun treat and a relaxing escape from your day-to-day troubles. Home meal kits have become popular in the past few years because they answer a few basic hurdles in day-to-day life: dining out is expensive, grocery shopping is a hassle, eating healthy can be difficult and boring, and coming up with new and interesting recipes to make at home can make writer’s block look like a cinch. But are meal kits a better deal than grocery shopping or eating out? Let’s take a look. Today’s contemporary supermarkets have an incredible variety of food for sale, as well as on-site bakeries and butcher shops—and more. On paper they are the model of convenience, but sometimes this can come up short. For instance, when you’re making a recipe that calls for a specialty ingredient. This could be an ingredient like gochujang, black tahini, harissa, or sumac, which not every big name supermarket branch stocks. Sure, you could still probably find it at a local specialty store, but that would require another errand and schlepping to a whole other place to wait in line at the checkout counter. With a meal kit, you select your recipes for the week and then everything comes at once, with all of the ingredients measured and proportioned to the exact specifications of your recipe. Not only do you not need to chase down random items at different stores, but you also don’t need to buy an entire container of a specialty item that you only need a dash or a teaspoon of. Eating out takes this ease to a new level—you don’t even have to know what ingredients go into your meal, much less cook them. All of the legwork, planning, and execution is taken care of, and you don’t have to lift a finger. We’ve all been there before. You hit your grocery store in the early evening, at the end of a long day when you didn’t have much for lunch and everything looks delicious, even the cleaning supplies seem to be making eyes at you. Next thing you know, you end up grabbing a lot of stuff you don’t need—mainly of the snack-time variety—and just when you think the coast is clear, you get to the checkout counter, where they have all the impulse buy items waiting to ambush you. With meal kits, you don’t have to worry about the impulse buys or the grocery store runs where you swear you had a very short, concise list—and a shopping cart that is piled over regardless. Meal kits help you stay within budget and within reason, because everything you need is compiled by the company and you don’t even go to the supermarket to put your willpower to the test. The temptation to overspend can also come into play when eating out. It can lead you to over-order, eating too much food and spending more than you planned. On average, meal kit companies charge about $10 per serving. This can be significantly lower than what you’d pay on your own, depending on what you’re making. 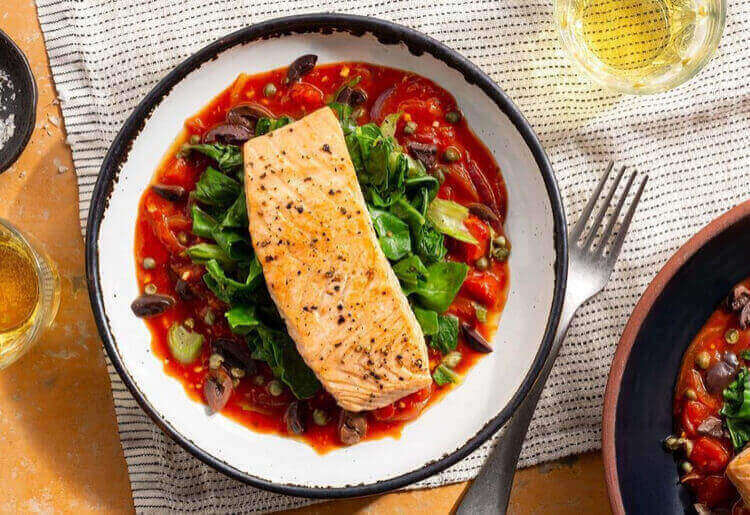 For instance, if you were to prepare an equivalent to Sun Basket’s salmon alla puttanesca with chard for 2 on your own, you’d need to buy 2 five ounce skin-on salmon filets or 10 ounces of wild sea scallops, some kalamata olives, and capers. Assuming you don’t already have some kalamata olives and capers in the fridge, that’s several dollars right there for 2 things that aren’t typically everyday items you’ll get a lot of use out of. At as much as $15 per pound, buying 10 oz of salmon filets could easily cost you about $9. If you opt for 10 ounces of sea scallops it could be more than $15 or $16. In other words, you could easily get to more than $10 per serving, and that’s assuming you already have the rest of the ingredients at home. Also, when cooking for one or for a couple, purchasing all the ingredients to make a home-cooked meal—especially a premium one that features fresh seafood—can cost you more than going out to eat, much less going to the grocery store. Also, when you’re cooking at home, while it's true you’ll have to buy more of the ingredients than precisely what the recipe calls for, this means you’ll also have leftover supplies for next time. In addition, you can also have more control over the portion size, meaning that you can make bigger amounts and have leftovers for the next day. When it comes to eating out, assuming you aren’t eating fast food, you’ll always have the option to tack on a glass of wine or a cocktail, and if you have a weakness for the dessert menu, this can lead to some real sticker shock when the meal’s over. And let’s not forget the tip. A big part of watching your weight and eating healthier is just simply knowing what it is you’re eating. With meal kit companies, you get recipes that include a comprehensive breakdown of all of the ingredients and the nutritional information for each serving. When you whip up food on your own—say, a home cooked batch of spaghetti and meatballs—you won’t be able to know precisely how much carbs, calories, or fat are in it, and you’ll be stuck with a lot of guesswork. With a meal kit, it’s all right there in front of you, and much easier to keep track of if you’re counting calories. Many meal kit companies also separate their menu offerings into categories that are quite helpful for people who are dieting or who have specific dietary restrictions. This can include such categories as soy-free, gluten-free, diabetes-friendly, and dairy-free, and diet-based categories like paleo or low-calorie. This can help you keep track of your meals and avoid any items you’re trying to cut down on. Many restaurants have taken note of the dietary concerns of customers and it's very common to be able to view the nutritional information for menu items. That said, this is by no means universal, and since restaurants are often known for big portions and rich ingredients, eating out can be the bane of just about any diet. It’s no secret that cooking at home is typically healthier than eating out—especially if your eating out option involves a drive-thru or comes on a stick. 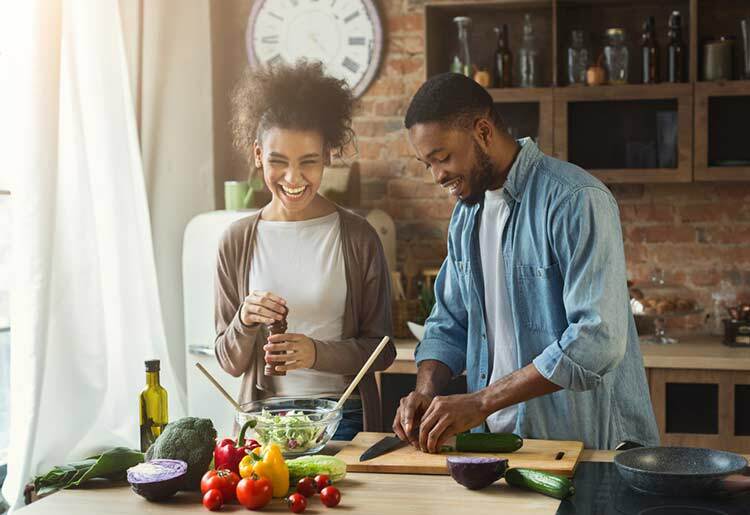 Learning new cooking techniques and getting acquainted with new ingredients and recipes is a great way to ensure that you start cooking at home more. This is one of the ways that meal kits can really help. Every week you’ll get to take your pick of recipes involving ingredient combinations and methods that you likely haven't tried yet, and after you’ve done it once, these recipes and items will forever be part of your kitchen repertoire. At the grocery store you’re presented with a wide range of options, but without the inspiration or any direction, it's easy to get decision fatigue and just resort to your go to recipes, the ones that you might already be kind of sick of. And eating out? While you can readily discover new foods and ingredients you like when eating out, someone else is doing the planning and the execution, so there’s only so much you can expect to learn. Meal kits give you the ideas, the inspiration, the ingredients, and a little, kind nudge to take some chances in the kitchen and surprise yourself at how easy great home-cooking can be. When buying groceries, you have the freedom to decide exactly what you want and how much of it. At the same time it can be easy to fall into routine and avoid trying new recipes, especially when you’ve got a million other things on your mind. With restaurants, while the convenience can’t be beat, it’s easy to spend more money and eat less healthy than you would in your home kitchen. Meal kits help with the planning and provide you with exactly the right amount of what you need, helping you cook delicious food easier than ever. That said, neither meal kits nor the grocery store are capable of completely replacing one another, and your best bet is probably to incorporate a meal kit into your cooking at least a couple times a week, and always keep the grocery store and eating out as options for the rest of the week. Just try not to go there when you’re hungry.